ALDERSHOT hotshot Ryan Mears has claimed his first national snooker title. Mears (left) awarded himself “ten out of ten” after a quick-fire victory in the final of the English Association of Snooker & Billiards’ Amateur Tour. And he pocketed the biggest paycheck of his snooker career. The 23-year-old, who is based at Sovereign Snooker Club, Farnborough, collected £300 following his 35-minute 3-0 destruction of Daniel Ward (West Midlands) at the North East Derbyshire Snooker Centre, Clay Cross. Although the final may have been a breeze, Mears put his family and friends through a rollercoaster ride of emotions during a remarkable day’s play. The Hampshire cueman had finished third in the southern section after a four-leg tour. The top eight from north and south qualified for the last-16 play-off. 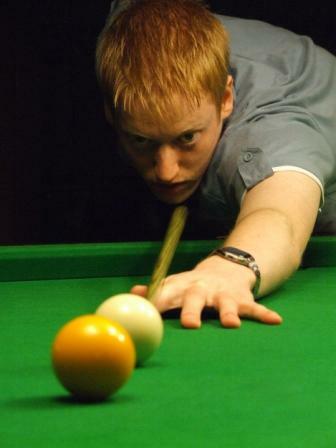 In his first group-stage match, Mears lost 3-2 from 2-1 up against James Hill (Wolverhampton). “(James) played well and I hardly had a shot,” he declared. And at 2-1 down to Ward and 33 behind with one red left, it looked all over. However, in a game that will live long in the memory, Mears laid a fiendish snooker, smacked in a long red and compiled a 35 clearance to force a decider. But when Ward opened the fifth frame with a 52 break, it looked like his opponent’s chance had gone again. Back bounced Mears with a 70 clearance to the blue, leaving Ward chasing snookers. After accounting for Shaun Wilkes (Doncaster) 3-1 in the last-eight, Mears defeated fellow Cuestars member Billy Castle (Marchwood) 3-1 in the semi-finals. Such is the strength of snooker in the south that no northern players made the last-four. Alex Dunkley (Southampton), the southern champion ahead of Castle and Mears, beat Jamie Barrett (Cleethorpes) 3-2 from 2-1 down and needing two snookers in the quarter-finals – but lost 3-2 to Ward from 2-0 up. Meanwhile, Castle saw off Gareth Green (Bradford) 3-2 before going down to the eventual tournament winner. The following week, Mears failed in his bid to land a second national title. He lost 6-1 to John Astley (Gateshead) in the English Six-Reds Final at the Star Snooker Academy at Sheffield Utd’s training facilities during the EASB’s finals weekend.